Looking east on Second Avenue between Washington and Ferry on Wednesday afternoon. One block down, sort of, and about two dozen more to go. That’s the word from Albany’s $8 million project to upgrade the look and infrastructure of several of its downtown streets. 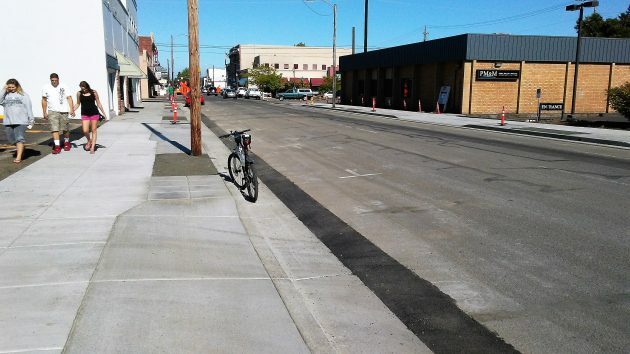 The contractor, Emery & Sons, has finished rebuilding the sidewalks on one block of Second Avenue, between Washington an Ferry streets. It looks kind of bare, but it won’t look that way for long. “We expect the trees and light poles to go in sometime this fall, which will finish things off nicely,” said Lindsey Austin, the Albany Public Works engineering technician managing the “streetscape” project and keeping the public and affected property owners posted. Downtown business owners have worried that the construction would be making this summer tougher for them than usual. The jungle of road-work signs and heavy equipment on the streets may keep customers away. But actually, it’s not hard to reach downtown destinations because actual construction is taking place at only one or two locations at a time, and the contactor’s crews are making sure public access is maintained. Austin reports that the city is still working with ODOT to obtain a permit for the work planned to take place within the state right-of-way on Lyon and Ellsworth streets, the downtown couplet of Highway 20. I thought the trees were to be planted last June?? It looks like we are safe? Don’t have to back-in park? Is the rest of downtown safe from awkward parking? There is no additional back in parking planned with this project.